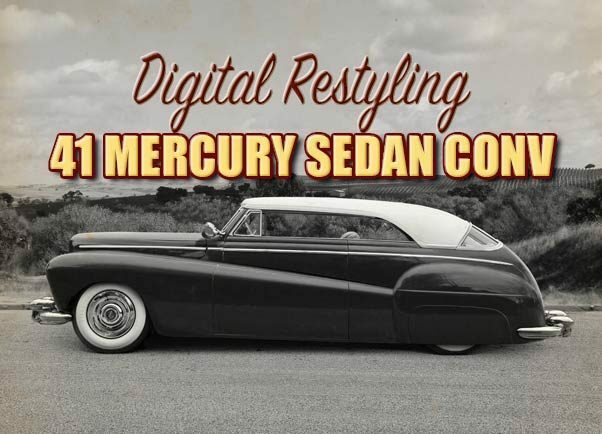 Digital Restyling the 1941 Mercury Sedan. Inspired by the Barris Joe Urritta 1941 Ford and Harry Bradley Designs 41 Mercury Sedan Conv. In 1949 Sam Barris restyled a 1941 Ford two door Sedan for owner Joe Urritta. 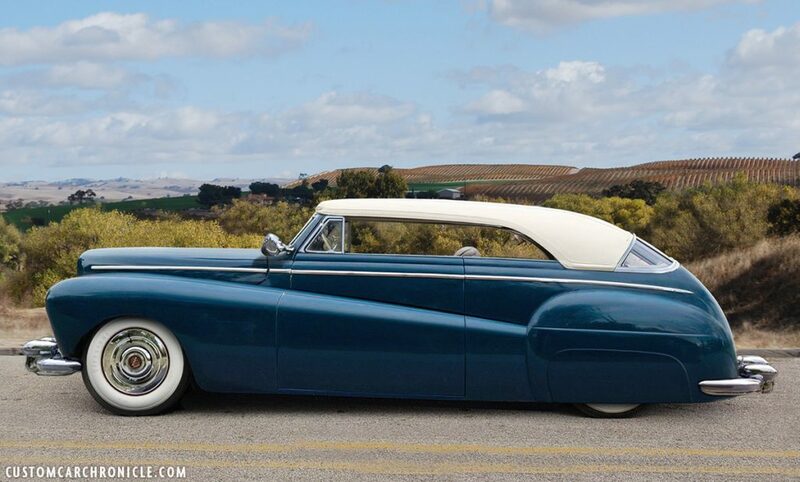 The most exceptional concept of this car was that Sam turned it from a regular sedan to a convertible sedan, cutting off the top, adding a convertible cowl and doors and channeled the body over the frame creating an unique look. I have always really liked the Urritta Ford, which was also known as the “4 Foot Kustom”. And for many years I have been wondering why not more Sedans had been turned Convertible Sedans in the beautiful late 1940’s style. Side view of the original Sam Barris Restyled Joe Urritta 1941 Ford. In 1990 Car Designer and Custom Car enthusiast Harry Bradley set out to create an new age Custom based on the Joe Urritta 1941 Ford designs. A complete concept which included a brake down of the original car, how that was created step by step, to many design illustrations how the Bradley Tribute Ford would look like. 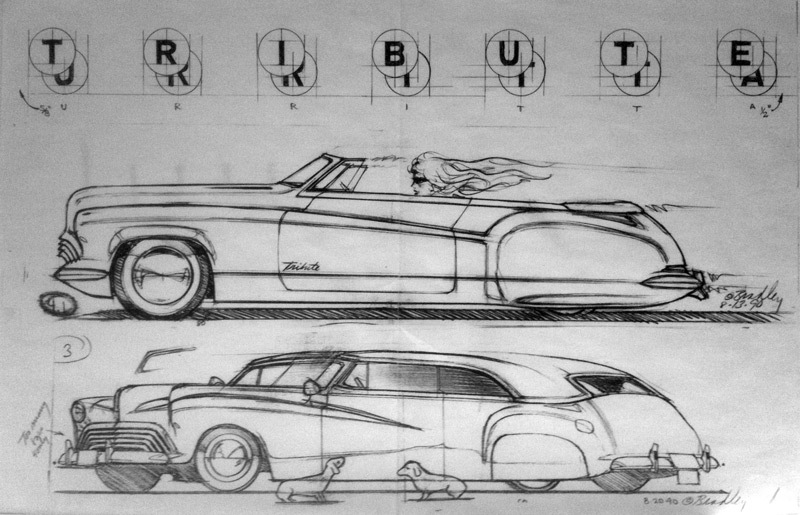 An article with some of mr. Bradley’s concepts sketches appeared in an 90’s Street Rodder Magazine and made a HUGE impact on me. Harry Bradley created this beautiful side view of his Concept Tribute Ford with the top removed and an front/side/rear illustration of the original Joe Urritta Ford. Later Butch Hurley and Rod Powell were contracted to create a real car roughly based on the Harry Bradley Designs. That car was never meant to be an exact interpretation of the original Urritta Ford, nor the Bradley Tribute designs. 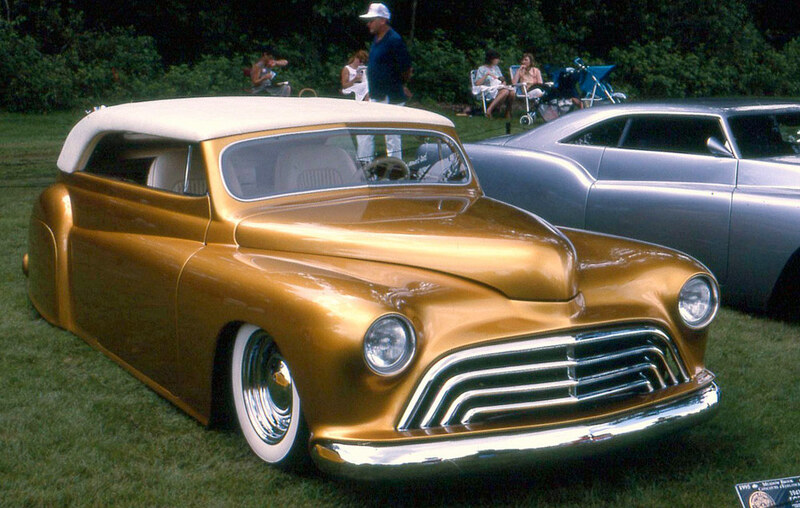 Although very thrilled with the seldom seen gold painted Tribute Ford, I kept on wondering how a 41 Sedan might look with some of the Harry Bradley Designs incorporated, but still created as an late 40’s, early 50’s style Custom. 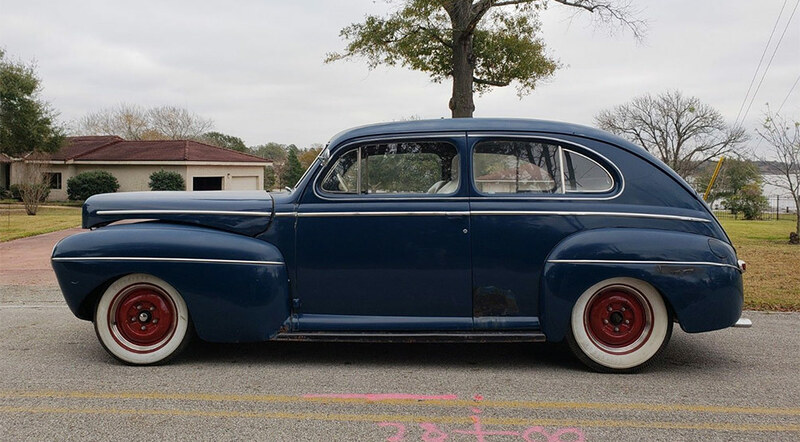 And the more I thought about it, the more I felt that a longer wheel base ’41 Mercury Sedan might be an even better start for a project like this. A little while ago I came across an nice side view image of an 1941 Mercury Sedan. (dead-on side view images are pretty rare, so I was very happy with this one, even though it was not as perfect as I had hoped for) Now my Digital Restyling of the Urritta/Bradley Inspired 1941 Mercury Sedan Convertible could start. 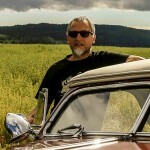 Original photo I started with for the Digital Restyling. I wanted to create this car as how it could have been done back in the late 1940’s early 1950’s, but I wanted my version to be a little less radical as the Urritta Ford. Not channeled that much, and the hood not so much sectioned, to create a little more “practical” proportions. The ’41 Mercury hood always has the tendency to optically go down in the front, and to prevent this I decided to pie cut the whole body with more taken from the bottom of the body at the rear than the front during the angled channeling. There is no need to actually section the body, since the rear fenders will be raised, and the bottom of the body will be hidden by the fade away fenders. The hood does need to be sectioned to fit in the new position, and will need to be sectioned a little more towards the back to get the right flow and slight nose up in the front look I’m after. I cut off the top, and reshaped the tops of the body. I first added slightly curved up original convertible door tops and vent window’s but did not care for the look, so I decided to keep the tops level with the belt-line, and use different vent windows (49 Chevy in my case, but anything could made to work) I slightly angled the windshield back, to create a bit more optical speed. I then set out to create the fade away fenders. I wanted to create full length fade-away fenders, unlike those used on the Urritta Ford which fade away into the doors. But I wanted mine to be less high than those on the Bradley Tribute Ford. I also wanted the bottom of the door to stop before the bottom of the body, leaving a small section of fender below the doors, making the door look a bit longer. When I started on the roof shape I knew I had to make a lot of changes to the rear portion of the car. The rear of the body needs to be angled forward, the top of the trunk needs to be lowered, and the section from the belt-line up at the rear needs to be all reshaped. And to make this all work the best way, the rear top portion of the rear fenders need to be angled back and reshaped. To create the look I was after I had to do quite a bit of work on the rear fender. the top portion was cut off, and moved forward, the rear portion was reshaped to create a bit more teardrop shape. The lower edge at the back was moved down a bit and at the front it was angled forwards towards the top. 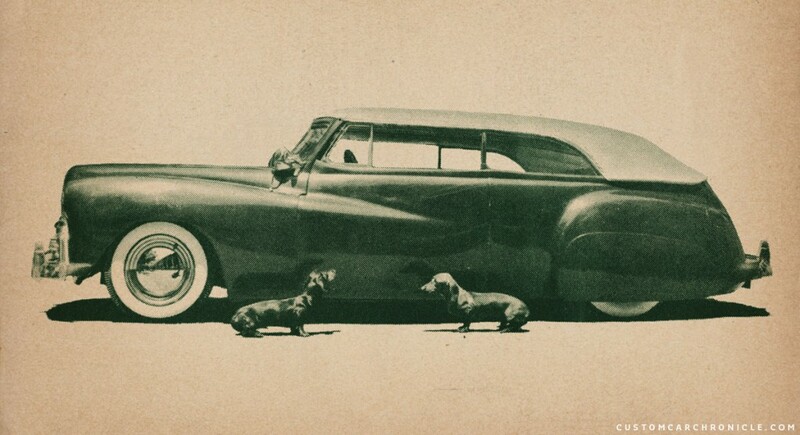 I have even thought about using an ’39-40 mercury fender to create the look I was after, but decided to work with the ’41 unit and just reshape it a lot. The character line on the fender was cut out and re-positioned to flow better with the fade-away fender line. My original idea was to create one car with three different tops. 3 Metal top in a similar way as the Bertolucci created top for the Buddy Ohanesian 1940 Mercury. But later I decided to change this idea a bit and create three different version, and not include the full metal top, but rather create a more streamlined hard-top looking unit using a wrap around window for that as well. The first version I did was a car that could have been done around 1948. The car was update with ’48 Ford bumpers, Appleton Spotlights, shortened side trim on the hood, stock taillights re-positioned to flow with the fender line. single bar flipper hubcaps on wide white wall tires. I added a dark green color to this version, as a tribute to the original Joe Urritta Ford version. First version is how it could have looked around 1948. The second version I did was actually the version I had in my mind all this time. The one with the wrap around rear window which was inspired by the harry Bradley Sketches. I really wanted to see how this more traditional looking wrap around rear window would look on an padded top, very much as how Bill Gaylord perhaps might have done it. I choose to leave the belt-line trim at stock length for this version, to create a bit more optical length. The hubcaps were updated to Cadillac Sombrero units, and the bumpers are created from 1947 Cadillac units from which the bottom part was sectioned, as well as the bumper guards. This was inspired from the Harry Bradley design, but incorporated as period units. Second version from around the early 1950’s. The last version is created as a Custom that could have been done around 1954 perhaps. The top was created using 1950 Chevy Hard-Top metal which was stretched and reshaped to fit the lines of the ’41 Mercury. I added a small scoop in the leading edge of the rear fenders and added three small teeth. The bumpers are still the sectioned 1947 Cadillac units, but now with the complete bottom section removed, and discarding the guards all together for a much more sleeker look. The hubcaps were updated with ’53 Cadillac units on tired with slightly smaller white wall section. And the center part of the ’53 hubcaps are replaced with the centers of the Cadillac Sombrero hubcaps. I added some teal paint to the main body and contrasting gold for the top. Last version (for now) as how it could have looked if created around 1954. In progress photo of the Butch Hurley/Rod Powell creation from the Butch Hurley photo Albums. The finished Tribute Ford in gold paint. Longer front end helps to stretch to the favorit proportions , full fade away is really sweet , I cant decide , all three versions are beautiful and hold their own place . Great custom ideas for sedan bodies ! !